The singer Hansi Führer began her career at the Orpheum in Vienna among others. Later followed other venues. 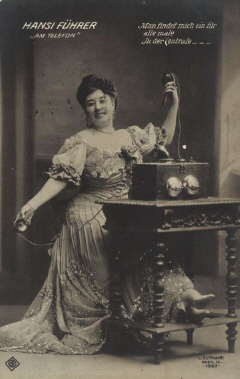 She led her own stage „Bradyscher Wintergarten“ from 1908 to 1910, afterwards she appeared at different cabarets. When she went to the USA together with her husband in 1914 she was able to continue her career as a cabaret artist and founded the „Weisses Rössel“. After her return to Austria in 1921 Hansi Führer continued her career as a singer on stage. Her only movie came in 1925 into being with „Lerchenfelder Sonntagskinder“ (25) where she played at the side of Robert Rainer and Leo Wintermayer.